Happy Holidays from the Untapped Potential Physical Therapy Team! Here is a list of some of our favorite therapy books and tools that promote health, flexibility, and strength. Cheers to a healthy 2019! Taming Pain: Lessons from the Trenches by Cheryl Wardlaw, PT. This book is written by our beloved mentor Cheryl. She eloquently (and hilariously) writes for the patient’s perspective to better understand pain and learn practical, simple changes to your daily routine to help you feel your absolute best. It Starts with Food and Whole 30 by Melissa and Dallas Hartwig. Dallas Hartwig is a physical therapist that used a personal nutrition experiment to eliminate his chronic shoulder pain. These two books outline what he and his wife researched and discovered about the link between the food we eat, inflammation, and how it effects our overall health. Foam roller…our favorite is the AXIS Black Roller from OPTP. Using a foam roller is a great way to mobilize joints and soft tissue (increasing flexibility) and strengthening core muscles. 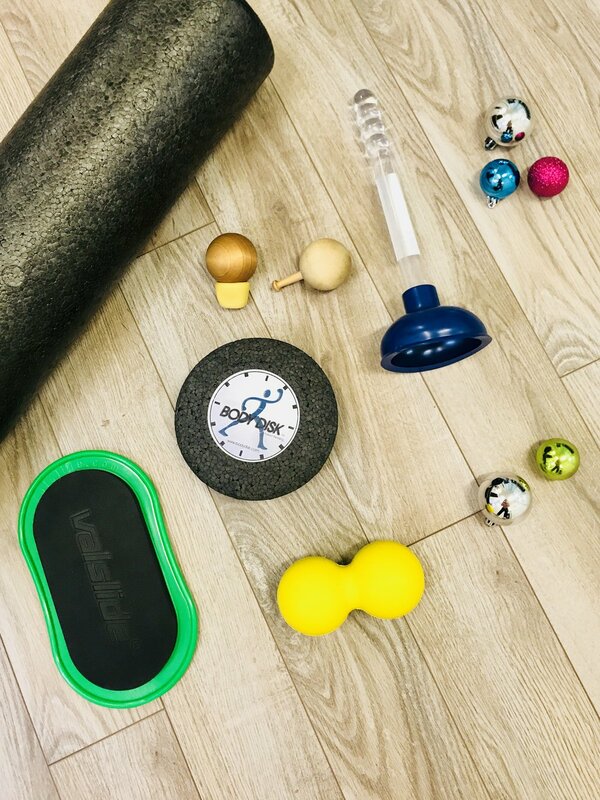 “Snowman with Hat” and “Peg” Soft tissue mobilization tools…use these tools to unwind soft tissue knots/trigger points in your legs, arms, and back muscles. Sink Plunger…this one might get a funny look or two…but it’s one of our favorites! This can be used to “plunge” soft tissue! Suction it to areas in the lower back, IT band, and shoulder blade regions and now you can mobilize the muscles and fascia in that region! Check out our Instagram/Facebook this Friday to learn more. SKLZ Dual Point Massager…great tool to work on the suboccipital muscles…those tiny muscles that connect your neck to your cranium. Do you get headaches/neck stiffness from sitting in front of a computer or in a car? This is the tool for you! Furniture Slider…this household item can be easily packed in a travel bag for workouts on the go! Check out this youtube with a demo of 20 ways to use the furniture slider for strengthening. The Body Disc…this amazing tool was created by one of our Certified Functional Manual Therapist colleagues Mark Marino PT. This can also be easily packed for on the go and is super light (4 oz!) Use it to increase flexibility and promote core stability.